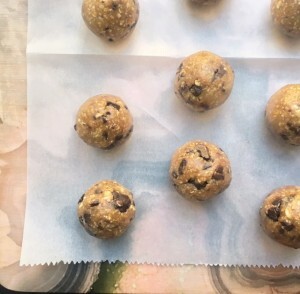 I saw a recipe on my favorite food bloggers site for no sugar added chocolate chip cookie dough balls and decided to use the base and sort of combo this recipe with a low sugar trail mix cookie that I make. The results were perfect! I can grab a couple of these on my way to the studio and know that they’re fueling me without adding any extra sugar to my morning 🙂 I’ll save that for a Sunday night! 2. Combine cashews, nut butter, and oats in a high power blender or food processor until well combined and smooth. Stir or pulse in the rest. 4. Put in a parchment lined Tupperware container and freeze for 30 minutes, then enjoy!